Wondershare is a Multimedia Software Group, It believes in providing innovative and easy-to-use products and service to enhance your digital media experience by converting, editing, managing, saving and sharing a wide range of popular media files. Today I post a review of Wondershare Flash Gallery Factory Deluxe. Using this software Now you can create eye-catching slideshows to impress the others? Regardless of your Flash skills. Enjoy! Have you ever had a great idea and wanted to learn how to create eye-catching slideshows to impress the others? Regardless of your Flash skills, Wondershare Flash Gallery Factory Deluxe allows you to create dynamic slideshows and beautiful photo galleries using your own photos. 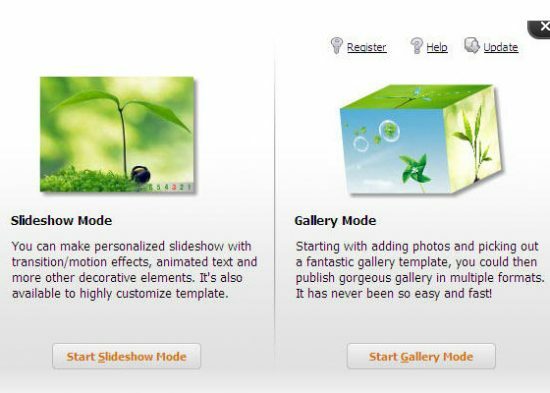 Wondershare Flash Gallery Factory Deluxe has two modes that you can switch between whenever you need – the Gallery Mode and the Slideshow Mode. It delivers over 50 templates and more than 100 transition and motion effects that you can play with. The application comes with an intuitive interface through which you can access the tools you need to produce interactive 3D galleries, professional flash banners, e-cards and so on. Preview and output SWF slideshow, HTML gallery or XML files directly. Slideshows and 3D image galleries can be created using your personal photos taken in trips, parties, on Festival like Thanksgiving. More than that, every slideshow or 3D gallery can be customized with pre-loaded templates, themes, cool effects like transitions and motions, text decorations with effects, clipart, animation, background sounds, your own backgrounds, and free 3D flash gallery templates.